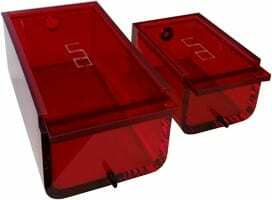 The induction box is made of 10mm thick acrylic with inlet and outlet hose connectors and a sliding lid. When connected to the UNO Gas Exhaust Unit and the lid is closed, there is high internal resistance for the ventilator of the Exhaust Unit, resulting in minimal anesthetic removal and optimal animal exposure. Once the animal is anesthetized, a slight opening of the induction box lid reduces the internal resistance from the exhaust ventilator and the unit begins exhausting at maximum capacity. This prevents anesthetic gas from entering the room/working area. Following rapid emptying of the anesthetic gas mixture the animal can be removed from the induction box. The UNO Gas Exhaust Unit can also be connected to an Active Charcoal Filter (for absorbing the isoflurane) or to an appropriate “in-house” exhaust system.